If residents of Saltford don’t want a bypass, there will be no bypass – that was the message from leaders of Bath and North East Somerset Council who attended a packed public meeting last month. 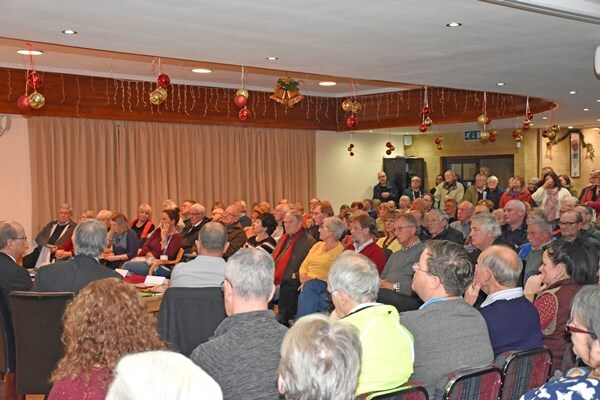 Around 200 people filled a room at Saltford Golf Club to discuss the issue after a blueprint showing how the West of England could be developed over the next 20 years included a bypass skirting the south of the village among a raft of suggestions for improving transport in the coming years. Such a scheme could turn Saltford “into an island surrounded by traffic”, said chairman of Keynsham and Saltford Liberal Democrats Duncan Hounsell, damaging businesses on the A4 and creating a “planning blight for a generation” even if it was never eventually built. Conservative Saltford councillor Francine Haeberling cautioned residents not to “throw the baby out with the bath water” by removing the option from the Joint Transport Study, however, as a large number of houses were being proposed, bringing more traffic onto the roads. The meeting was attended by B&NES Council leader Tim Warren and transport chief Anthony Clarke, who said he didn’t believe a bypass was “viable” and was backing calls to ease traffic with a southern relief road around Bristol, taking vehicles from a new junction off the M4 around Bristol, to meet up with the M5. Many at the meeting called on councillors and planners to look at other transport options for the Saltford area, such as a light railway. Meanwhile, former parish council chairman Reg Williams called for another village-wide poll on the issue 14 years after the first, which came out in favour of a bypass, he said. Other residents said they wanted to see the blue line denoting a potential bypass – which didn’t show an exact route but was for illustrative purposes only, the council leaders said – removed from the document immediately. A public consultation ran until December 19 on the Joint Spatial Plan (JSP) and Joint Transport Study, which have been drawn up by the four former Avon authorities – Bath and North East Somerset, Bristol, South Gloucestershire and North Somerset – to plan for future housing and employment demand. Feedback from the consultation on the transport proposals will now be used to draw up recommendations, which will be published for further public consultation later this year. A final JSP is expected to go to the Government for approval in 2018.